It’s time to set the sail for Treasure Island and embark yourself in the ultimate gambling adventure. Along with a crew of Irish pirates you will be on the way to some big jackpot prizes. This Microgaming features only 3 reels, but thanks to multiple special features and attractive layout, this is one of the nicest slots to play. 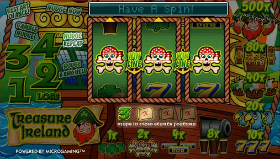 The luck can always come from the fact that there are all sorts of Irish related symbols and it won’t be long before you can start seeing some nice money in your pockets coming out of this simple and captivating online slot machine. 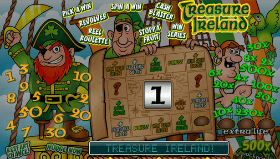 Treasure Ireland slot features 3 reels, only one pay-line and 9 different winning combinations. The biggest prize is a fixed jackpot. This is awarded when you get three jackpot symbols that are represented by the Irish pirate and there is a 500x prize. The second highest jackpot is worth 80 times your wager. If you want to play a 3 reels video slot game that at the same time also holds some amazing number of special features, then Treasure Ireland slot is the answer. You just need to take a quick look at the slot machine and you can instantly notice the fact that there are plenty of things to trigger while spinning the reels of this game. The name of this bonus round is called “The Treasure Map Bonus” and you need to get 3 maps symbols on the active payline to trigger it. Once this happens you are taken to that second screen and there you can hit the spin button and get all sorts of special features like multipliers and others. The coin denomination for this game starts at $0.10 and goes up to $10. This leaves you with the possibility to win up to $50,000. The betting however is capped at 1 coin per spin. Another interesting feature that you can find at Treasure Ireland slot is the Nudge and Hold. You can use these to increase the number of winning combinations that you get as you can use this feature to your advantage. There are always some exciting adventures waiting for you at Treasure Ireland slot game. In case you love pirates and everything Irish, then you can have little to no problem loving this slot machine. There are some huge payouts coming from the winning combinations and the Treasure Map bonus game is always the one to bring the best pays. 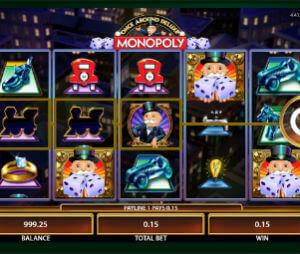 Use the Hold and Nudge features to increase your winning chances and don’t forget to have fun.